The act of rolling sushi is far more art than science. And for many newbie sushi chefs it can be an infuriatingly difficult skill to even learn, much less master. But with these helpful sushi-assembling assistants, you'll be rolling like Jiro-sama in no time. 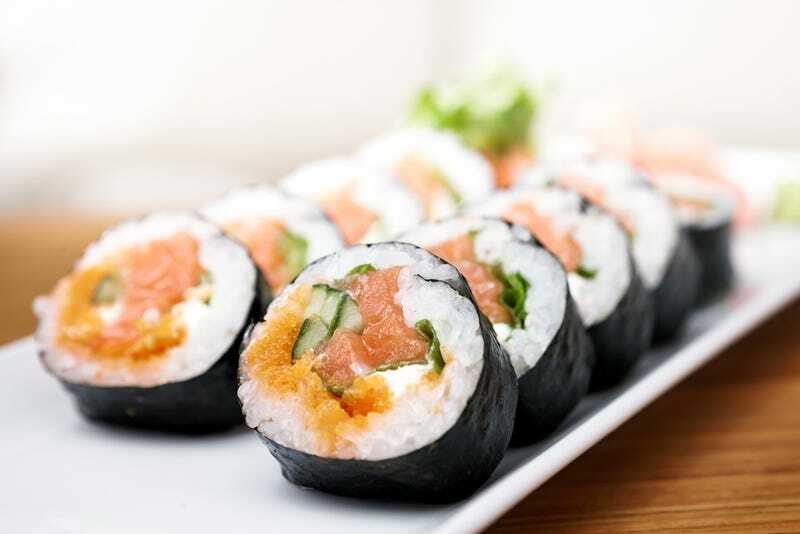 Traditionally, sushi is assembled by laying down a sheet of Nori (sushi's seaweed wrapper) atop a bamboo mat, known as a Makisu, which helps the chef roll, compress, and form the heaping of rice, vegetables, and fish piled atop it into a familiar cylindrical shape. But seriously, who has time for that? These five devices will generate perfect Nigiri without the hassle of doing it by hand. If you can't manage to track down a bamboo sushi mat or don't want to invest in more culinary trappings when you've just started out in sushi-making, don't worry. You can get the same result from a folded-over tea towel. Take a tea towel (hand towels will work in a pinch as well), fold it in half lengthwise and lay flat on a counter. Cover it in plastic wrap, stack your ingredients, and then roll them up using the towel to guide the process. Just don't press too hard, otherwise the nori wrapper will tear. The Leifheit Perfect Sushi Roll ($7.78) is, in essence, an enormous joint-roller designed for raw fish and cooked rice. Simply lay a sheet of nori in the machine, load up your toppings, close the lid, and give the slip a tug to roll it all into a 9-inch long tube. There's very little that can go wrong and demands virtually no prior sushi-making experience to use. The marketing says it works for other kinds of rolled food as well—miniature chocolate logs for everybody! If you need to feed a crowd, and fast, try the Sushezi. This tubular device compresses your rice and toppings into a sturdy cylindrical shape and the extrudes the nearly finished rice log into a sheet of nori for a final wrapping. There's an inordinate amount of clipping, twisting, capping, and squeezing involved but it appears to be pretty fool-proof. The biggest obstacle between you and a proper sushi roll is knowing how much rice to use. Too much and the roll will crack like an overstuffed burrito, too little and the roll will be limp. The $35 Sushiquik's patented training frame ensures that even first-time sushi chefs dole out the appropriate amount of rice while the included "roll cutter" attachment guarantees everybody will get an evenly-sized slice. If you would like to eventually get good enough to start rolling with the traditional bamboo mats, take a look at the Sushi Magic. It utilizes a silicon sheet designed to shape and evenly compress the roll as you twist the device's outer handles. There's very little guesswork involved and it appears to produce fairly consistent sushi tubes. Plus, the sheet is nonstick so you won't spend too much time picking grains rice off of it during cleanup.